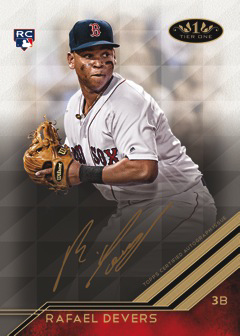 Topps first premium baseball product of 2018 is LIVE at Sports Cards Plus, a.k.a. The Super Hit Factory. Each box of 2018 Topps Tier One ($124.95 per box) has three cards, two autographs and one relic. Although not all of the autographs in 2018 Topps Tier One Baseball are signed on-card, many are. This includes all of the cards in the most common parts of the signature checklist: Prime Performer Autographs (veterans and retired players), Break Out Autographs (rookies and young stars), and new Tier One Talent Autographs (skill-focused themes). All of these come numbered to 299 or less with Bronze Ink (/25), Silver Ink (/10) and Gold Ink (1/1) parallels. 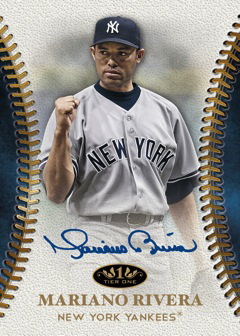 Tier One Autographs and its big names-only checklist return as a case hit. All are hard-signed and numbered. Parallels here are also ink-based Bronze (/25), Silver (/10) and Gold (1/1). Clear One Autographs are back. Printed on clear acetate, none have more than ten copies. Dual Autographs (/25 or less) and Triple Autographs (/10 or less) stick with the on-card theme despite coming with multiple signatures. 2018 Topps Tier One Baseball has Cut Signatures, but not many. The checklist is slated to have less than 30 cards, all of which are one-of-ones. Tier One Relics is where the majority of memorabilia cards are found. More than 50 different players are on the checklist, although in the past, some have had multiple cards. Base versions are serial numbered while parallels come in Dual Relic (/25) and Triple Relic (1/1). Besides being more scarce, parallels have a patch piece. 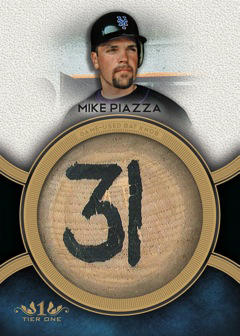 Tier One Legends Relics take a similar approach, with game-used material from retired greats. Prodigious Patches return with over-sized swatches. These come numbered to 10 while Platinum parallels are one-of-ones. From its earliest days (not that that was an incredibly long time ago), Tier One found a niche with bat knob cards. Other lines use them, but not like they’re found here. They return with a large checklist. All are one-of-ones. 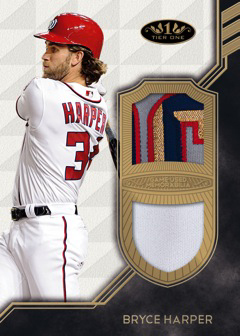 Other unique relics include Limited Lumber and All-Star Patches, which have a jumbo swatch from a 2017 workout jersey. 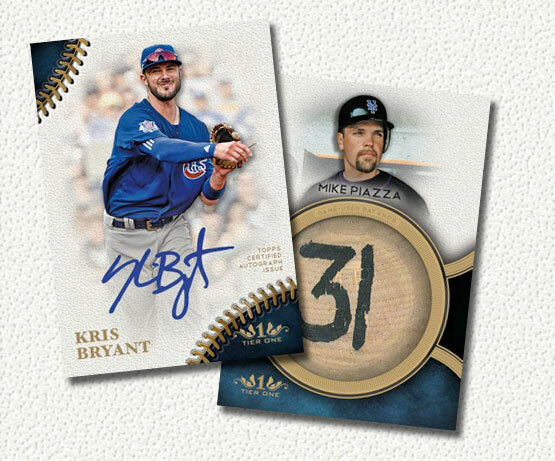 Being a more high-end brand, it shouldn’t be surprising that 2018 Topps Tier One Baseball has several autographed memorabilia inserts. Autographed Tier One Relics are the most basic of the bunch. Self explanatory, they come with a game-used swatch and are numbered to 100 or less. 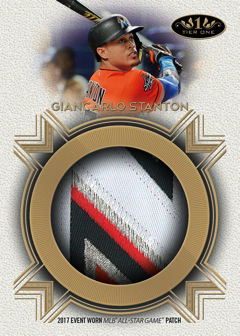 Patches are on both Dual Relic (/10) and Triple Relic (1/1) parallels. Dual Autograph Tier One Relic Book cards are dedicated to current players. These have just Dual Patch (1/1) parallels. Autographed Prodigious Patches have jumbo swatches, much like the unsigned versions. Base versions have no more than ten copies while Platinum patch parallels are all one-of-ones. 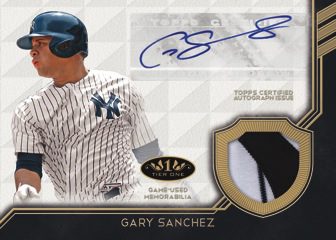 Speaking of one-of-a-kind cards, 2018 Topps Tier One Baseball has four autographed relic themes where everything has just one copy. These include Autographed Bat Knobs, Autographed Limited Lumber, Cut Signature Relics and Signature Tools Autograph Relics. The Signature Tools cards come with a piece of the pen used to sign the card.